Quick Search is a potentially unwanted program that was created by the infamous Polarity Technologies Ltd. This company has gained attention because of the browser hijackers that were created by it. In fact, a browser hijacker is associated with the PUP as well, and that is because the company usually creates add-ons to represent hijackers. In this case, the suspicious Quick Search is employed to introduce the users of Google Chrome to Search.searchquicks.com. It is possible that, in the past, this suspicious software was compatible with different browsers, but, at the time of research, you could only install it onto Chrome. Needless to say, if you need help removing Quick Search from different browsers, you should add a comment below so that we could add the instructions for you. 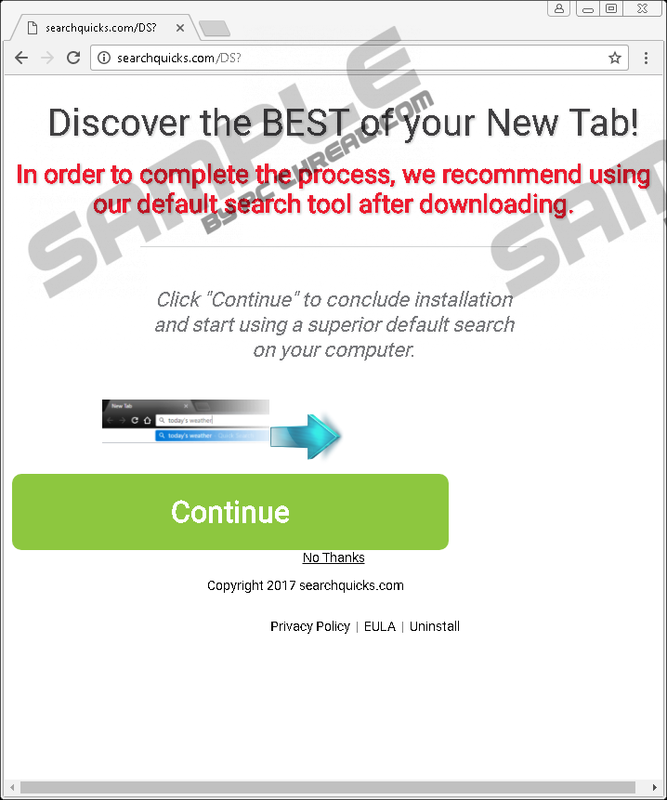 The official website representing Quick Search is searchquicks.com/DS?, but the installer is not available on this site. If you click the “Continue” button to start the installation of the tool that allegedly can make your New Tab page better, you are introduced to the installer available at the Chrome web store. This installer represents the 3.3 version, but it is not as popular as the 3.1 version, which is represented via a different page on the Chrome web store. This version has 20 times more users, but, essentially, it works in the same way, and it has the same permissions. These include managing your extensions, introducing you to Search.searchquicks.com, and changing your data on the websites you visit. Of course, an entirely different source could be employed for the distribution of this potentially unwanted program. Maybe you have acquired this PUP using a third-party installer along with malware that also deserves removal? Have you noticed that Quick Search redirects your searches via extsearch.maxwebsearch.com to Yahoo Search? Even if you are familiar with this search engine – and we are sure you are – you have to be careful about links shown to you. Unfortunately, they are modified to showcase sponsored content, which is why you cannot trust the extension and the search tool altogether. This is the main reason we suggest deleting them as soon as possible. In case you have interacted with the search results already, you have to be cautious about the third-party tracking cookies. Also, if you have downloaded anything represented via sponsored links, or if you have disclosed private information, you have to think if you need to take appropriate measures to protect yourself. You must be interested in deleting Quick Search by this point. If you want to discuss this PUP more before you decide whether or not you want to erase it, you can post a comment below, and we will try to answer all of your questions. If you cannot wait to get rid of this suspicious piece of software, you have to decide how you should remove it. If you find that there are quite a few malicious threats that require immediate removal, maybe it is wise to utilize anti-malware software that can automatically eliminate all infections at once? If you want to remove Quick Search manually, you can find the instructions below. They show how to erase the Chrome extension, as well as the cookies that might have been employed to spy on you. As mentioned previously, if you have any questions, you can start a discussion in the comments section. Tap Alt+F to access the menu on the right. Choose More tools and then Extensions. Click the recycle bin next to the unwanted add-on. Tap Ctrl+Shift+Delete for the Clear browsing data menu. Mark the boxes indicating the data you want to delete. Quick & tested solution for Quick Search removal.